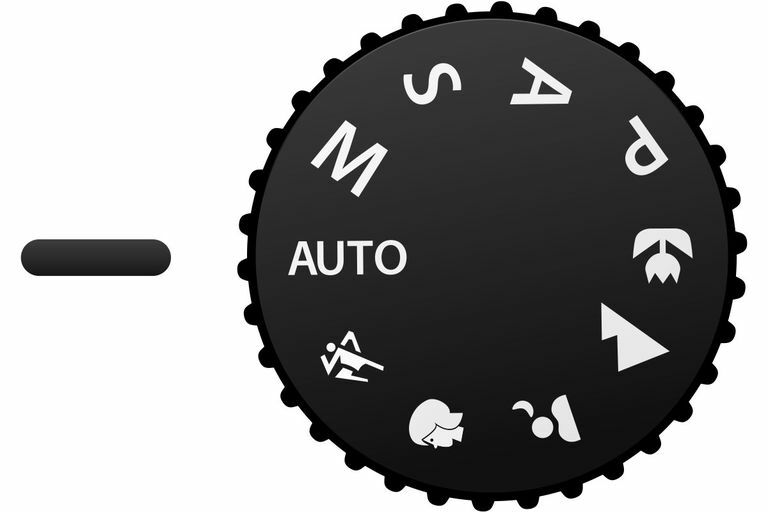 What Is the Mode Dial on Your Camera? Depending on the type of camera you own, you may be overwhelmed with the large number of buttons, dials, and parts that the camera has. If you only have time to figure out one part of the camera, pay attention to the mode dial. If you're unsure what that means, continue reading to answer the question: What is the mode dial? The mode dial is one of the most important parts of the camera, giving you access to the shooting modes. It helps to know what each icon means to achieve the best results when shooting. The P mode is short for “programmed auto,” which means the camera controls shutter speed and aperture, leaving the user to control the other settings. Use P for basic shooting situations where you want a little bit of control. The S mode is “shutter priority,” which means the photographer selects the most appropriate shutter speed, and the aperture is set automatically by the camera. The A mode is “aperture priority,” which means the photographer sets the best aperture for the image, and the shutter speed is set automatically by the camera. The A mode is good for softening background details. The M mode is “manual,” meaning all settings are done manually. The Smart mode, also called the Auto mode, is the opposite of the M mode. In Auto mode, the camera makes its best determination of what all of the settings should be, based on the lighting conditions and the subject matter. This is a common mode for a point and shoot camera. Sometimes, the Auto mode is represented by an empty rectangle or by a simple icon of a camera. In addition, the Smart or Auto mode may be in a different color from the other selections on the mode dial. The Scene mode, also called the SCN mode, is another point and shoot camera type of feature, allowing you to select a “scene” that is most similar to the type of photo that you plan to shoot. For example, if you want to shoot a child’s birthday party, you might select a “night” mode, a “candle” mode, or a “party” mode. The Movie mode (icon with a movie camera, not shown in this image) is used to change the camera's settings to prepare for shooting video. In this mode, you typically can use the shutter button to stop and start the movie, although some cameras also have a dedicated movie button. The Special Effects mode (typically an icon with a star inside a camera, not shown in this image) gives you access to any special shooting modes that the camera may contain, such as a black and white mode. The Macro mode (icon resembling a tulip flower) is used for shooting extreme close-ups. Macro allows the camera to focus properly on a close-up photo and adjusts the flash intensity to allow for proper exposure. The Portrait mode (icon with a head turned to the side) is good for blurring the background and making the subject’s face stand out. The Panorama mode (icon with a rectangle that's stretched, not shown in this image) is the mode to use when you want to stitch together two or more images to create an especially wide image that shows a view of 90 degrees, 180 degrees, or more. The Landscape mode (icon with mountains) increases the depth of field in focus and is good for landscape and nature photos. The Sports mode (icon with a runner) is good for capturing fast-moving subjects. The Flash mode (icon with a lightning strike, not shown in this image) allows you to switch between automatic flash, no flash, and constant flash.